The appeal of this conservatory kitchen is due to the eclectic ensemble of workstations and plants that do not over shadow the room’s finishes and its main feature, the commercial glass roof. Built-in cabinetry and exposed appliances would definitely dominate the room’s appearance. Allowing plenty of space between each separate Workstation to accommodate a large assortment of plants is the key that makes this room feel like it is still more of a place for plants and people than just a kitchen. Imagine, cooking, eating and just hanging out in this indoor conservatory garden! The large unfitted piece to the left is a complete Range Workstation (TP72-MH-T/B72-OC) that conceals two ovens and features custom stenciled door panels. Having supper efficient workstations like this one with its extra deep counter tops and storage systems really frees up the floor space, one of the keys to a furnished kitchen design. 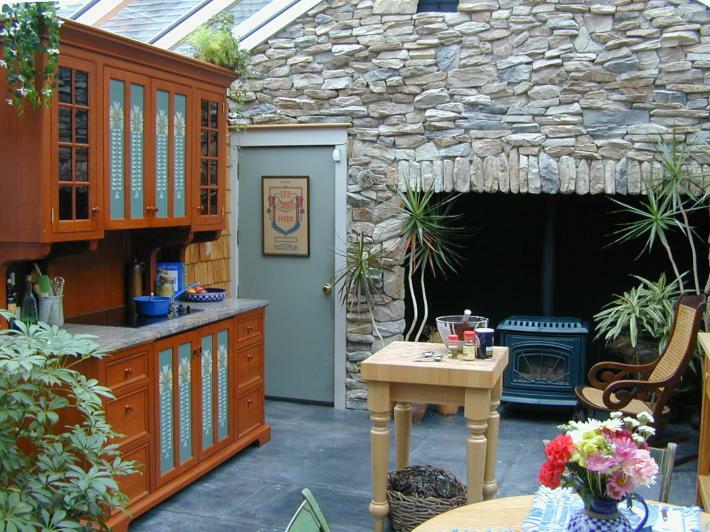 The freestanding sink Workstation is in front of the window wall to the right in this conservatory kitchen. A butcher’s block, gas stove, rocking chair, breakfast table and the Refrigerator/pantry workstation (behind the camera) completes this very special room!